The material is inserted inside the laser system and held taut in the longitudinal direction during the cutting stage by a pair of opposed clamps. 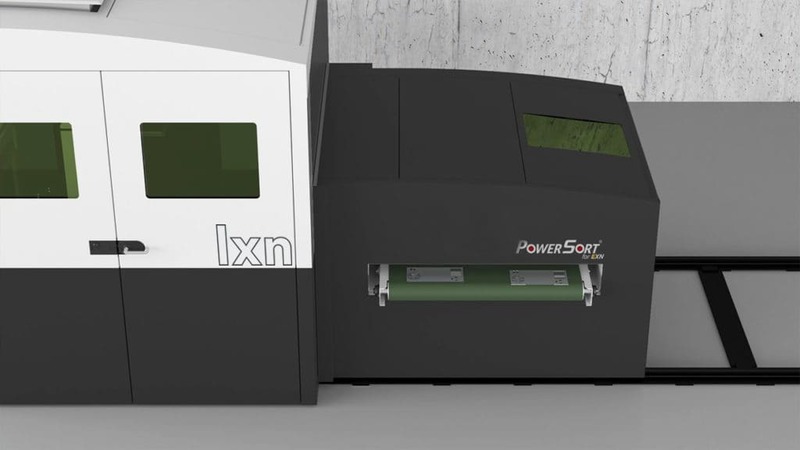 Once the material is held taut, the laser head begins to cut the waste figures, which fall directly into a dedicated container. The scrap container is readily accessible and easy to empty. The laser head cuts the contour of the finished part, which, depending on the type of production, may be held by micro-joints (tabs) until the programmed final separation. Before finally detaching the finished parts, a conveyor is arranged in a longitudinal direction under the working area. The laser head now cuts through the micro-joints so that the part falls onto the conveyor. This operation is performed on all the parts present in the working area. Upon completion of the cutting stage, the conveyor carries the parts away from the cutting area and drops them onto another belt positioned below in a crosswise direction. The products are now removed from the machine body ready to be processed and stored in the warehouse. Flashback occurs during cutting of the material in machines with traditional supporting beds (fakir bed). When the head cuts through the material at the point of contact with the bed, it can leave a mark like a small dark burn. The suspended cutting system does away with this type of problem: the material is held taut by the two clamps instead of being supported and there are therefore no points of contact to create a flashback. In traditional laser cutting systems the supporting beds for the material inside the cutting area necessitate cutting large scrap into smaller pieces, which can then fall through the gaps left by the supports. Also in this case the suspended cutting system does away with the problem, since the cutting area under the material is completely free of supports. Large scraps can fall directly into the relative bin, thereby shortening production times compared to traditional machines. The same principle applies for the waste skeleton in the case of productions with many attached parts within the working area. Once the finished products have been extracted, the skeleton is made to fall directly into a bin without having to use the laser head again. When machining very thin materials using traditional laser cutting systems, it becomes complicated to guarantee precision due to the vibrations that are triggered by the laser head gas jet. With this exclusive Dallan cutting system, the suspended material is held taut by a pair of opposed clamps and the pulling force is adjusted according to the type of material used. The tension is therefore always optimal so as not to create vibrations or elongate the material. With this technology, materials as little as 0.15 mm thick can be machined.